South Kerala includes the districts of Thiruvananthapuram, Kollam, Pathanamthitta, Kottayam and Alappuzha. Prior to Indian Independence, most of these areas belonged to the Travancore Kingdom. For centuries they shared common rule. Travancore royalty ruled most areas of today's South Kerala, from the city of Thiruvananthapuram (aka Trivandrum). Thiruvananthapuram is the southernmost district in Kerala. Trivandrum city, the district HQ, is important in many respects. It is the largest city as well as the capital of Kerala. You might have heard about a massive treasure find in a temple in a South Indian town. That town is Trivandrum. 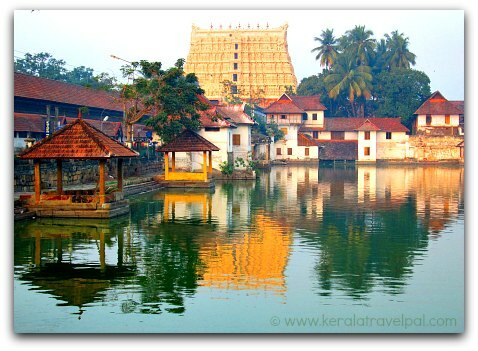 Sree Padmanabhaswamy temple in town has been closely associated with the Kings of Travancore, for several centuries. The recent treasure find from an underground vault was of over US$22 billion, just in material value. The real value could be well over a hundred billion US dollars. And guess what, the largest underground vault is yet to be open! While the temple is almost a must visit place, the city has several other attractions, mostly linked to a historic past. Napier Museum, Sree Chitra Art Gallery, Kuthiramalika and Kanakakunnu Palace are places where we get the feel of a long lost past. Do you want to get really busy within the crowded city? Shopping and chasing ethnic food delights can soak up a lot of time. Science and Technology Museum, Planetarium, the Zoo and Observatory tower appeal to the observer in us. More fun waits out of the city, in the form of backwaters and beaches. The backwater belts of Akkulam, Veli and Thiruvallam are frequented by local families and international tourists. 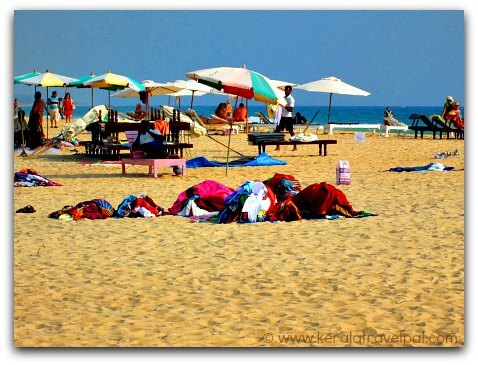 Listed among global tropical destinations, Kovalam beach is one of the important tourist spots in South Kerala. Vibrancy keeps Varakala beach unconventional and well liked. Somatheeram is hailed as the beach of Ayurveda where as Shanghumugam is the city beach. Kanyakumari experience is something that is worthy of pursuing for. The southern tip of India is a meeting point of oceans and a melting pot of serenity and spirituality. Kanyakumari is part of Tamil Nadu and 60 kms from Trivandrum city. Kollam, best known for its conventional industries such as cashew and coir has gone quite unconventional pursuing new opportunities in tourism. And why should not they? Opportunity is as expansive as the backwaters that cover about one third of the district. To make things even better, Ashtamudi Lake branches eight to encircle Kollam town. For Ashtamudi is just one among their many backwaters. Sasthamkotta, Paravoor, Alumkadavu and Munore Island are all great experiences, if you venture boat riding or sightseeing. And to top it all, there is a monster boat ride from Kollam to Alappuzha. So much for the backwaters. What is left? What is left is serenity, something that is a rare find. People exploring Kollam find that in plenty at the adobe of Matha Amrithananadamayi. Matha is a saint, alive and active. She has touched the hearts of millions around the world. For that reason they call her Amma which means mother. Kollam has its fair share of beaches, Thangasseri, Thirumullavaram and M.G beach, even though none of them are at par with Kovalam or Varkala. 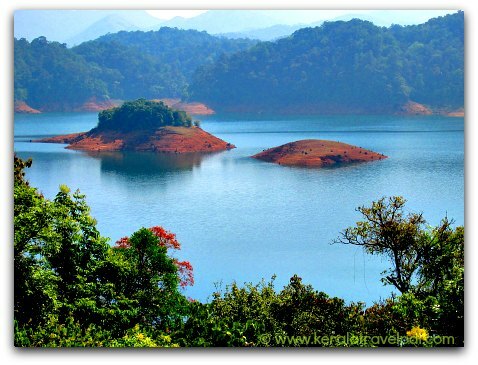 Thenmala is one of the must visit eco-tourism initiatives of South Kerala. Thenmala uses the resources of Shendruney Wildlife Sanctuary to create an experience that is educational and entertaining. Shendrunney Wildlife Sanctuary is a tourist spot by its own right. Not far from this eastern corridor of Kollam is Palaruvi falls, famed for its medicinal waters. Palaruvi is also one of the largest waterfalls in Kerala. Are you ready to hang around more? What is left on explorers list include Mayyanad, Paravur Elephant Rides, Puthenkulam Elephant Village, Adventure Park, Ashramam tourist village, Rameshwar Temple, Jatayu Rock and Ochira. Pathanamthitta is the pilgrimage district. There is a long list of temples and shrines where people gather in the hope of enjoying a rare moment of divinity. Sabarimala Sri Dharmasastha Temple is located in remote Pathanamthitta, almost in the middle of the forest, up in the mountains. Between forty five to fifty million devotees reach there during the pilgrimage season of November to January, every year. Sabarimala is one of the largest pilgrimages in the world. Maramon convention is also quite big. About a couple of hundred thousands of people participate in the three day event, held at the banks of River Pamba, near the town of Kozhenchery. Spirituality is only one aspect of Pathanamthitta. You may be glad to hear that the other vital aspect is nature itself. About half of Pathanathitta district is covered by forests. Incredible! Especially when we consider that Kerala tops the population density charts in India. The news only gets better. Most of these forests are untouched by man. That is the reason why we have to be at Gavi. An eco tourism destination of distinction, Gavi is the place to be, to enjoy the best of Pathanamthitta. 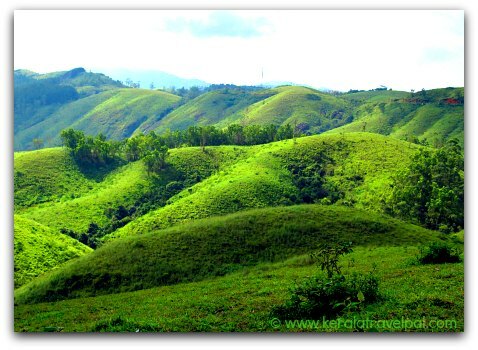 Charalkunnu hill station, Kaviyoor Rock Cut Temple, elephant training centre at Konni, Perunthenaruvi waterfalls and Aranmula are considered as important travel destinations. That does not mean there are no other great tourist spots here. The list is quite long, and the editor in me is not left with much of a choice than to type them all. You will have to be quite selective in deciding where to go from the following- Niranam church, Manjanikara Church,Mannadi, Omallur, Malayalappuzha, Kadammanitta, Kodumon, Chilanthiyambalam, Pandalam Palace, Parumala, Kakki reservoir, Moozhiyar and Maniyar dams, Vasthuvidya Gurukulam, Niranam, Mannadi, Pandalam Palace, Malayalappuzha, Kadammanitta and Chilandiyambalam. Pathanamthitta is also the land of Snake boat races, Padayani, Kathakali, ox races and temple festivals. Kottayam is known for its rubber plantations, print media and churches. A renowned stronghold of Christians in Kerala, Kottayam was the first place in India to achieve 100% literacy. Kottayam town, the district HQ, is a convenient stop over town. People travelling to the eastern hill stations, the western backwaters and southern pilgrimage destinations alike find Kottyam town handy for a meal if not for overnight stay. The main attractions are Vembanad backwaters, Poonjar palace, Kumarakom bird Sanctuary, Elaveezha poonchira, Vagamon, Aruvikkuzhi, Aruvichal and Maramala waterfalls. 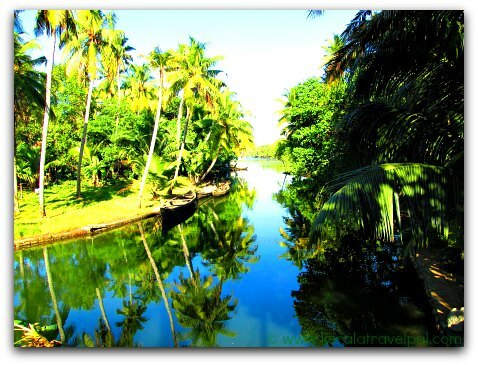 The backwater belt of Kumarakom is equally pleasing for its lush landscape and country life. Transformation of this simple waterside village to a globally sought after travel destination is nothing short of magic. 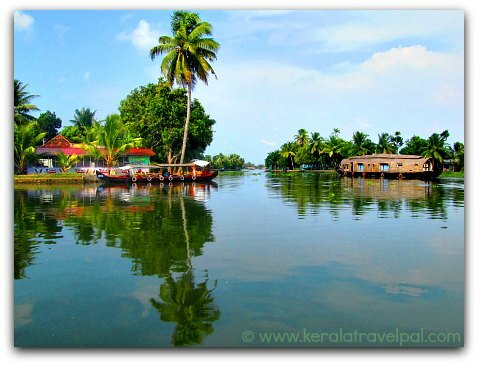 Kumarakom is traversed by many canals. These narrow canals are no comparison to the nearby Lake Vembanad. The Lake is not just vast, it is surprisingly vast. House boats that float around are in plenty, so any reason to feel lonely is out of the equation. Vennimala, Matrumala, Alapra, Kottathavalam,Ithipuzha, Kallara, Kudamaloor, Ramapuram,Pallam Backwaters, Illickal Mala, Kootickal, Nadukani and Panchalimdu – time permitting, there are several spots to explore . Most of them are hills, a few are backwaters and the rest have a touch of heritage. If your Kerala visit is for backwaters, then Alappuzha is the place to be. While there are enchanting backwaters elsewhere, Alappuzha is usually the initial choice and deserves to be so. Alappuzha town is the district headquarters. Canals that criss-cross the town make up effective veins of transportation. Kuttanad is a farming region. At the aesthetic level, there is the Kuttanad of indescribable beauty created by backwaters, rice fields and palm groves. At the achievement level, it is the top producer of rice and hence named the rice bowl of Kerala. At the curiosity level, it is where the rice fields stay below the level of the canals and hence protected by huge dykes. The coastal district of Alappuzha also has beaches and fishing harbours. The most popular beach for locals is Alappuzha beach near town. The beach that tourists flock to is Marari near the small town of Mararikulam. Pathiramanal island is an uninhabited tiny island in the middle of Lake Vembanad. Filled with lush green, it is a bird haven and hence a tourism spot. It is located near the border to Kottayam, not far from Kumarakom. A visit to Alappuzha may take you to some of the local shrines and monuments. They include Krishnapuram Palace, Mullakkal Rajeswari Temple, Karumadikuttan, Champakulam Church, Chavara Bhavan, Chettikulangara Bhagavathy temple, Ambalappuzha Sree Krishna temple, Sree Nagaraja temple at Mannarsala and the churches at Edathua and Arthunkal.